The changes needed to provide a robust environment to ensure compliance and minimise the economic impacts will affect all functions, not just risk management. Both the standardised approach (SA) and the internal model approach (IMA) have changed from earlier iterations. Existing systems may not be suitable without significant investment/upheaval. IMA approvals will now be granted at the individual trading desk level rather than firm-wide. Any desks given IMA approval will have to undertake new and stricter performance tests. Failing tests need to be reported immediately and the bank will have to revert to the SA. The purpose of FRTB is to calculate the capital charges on your business, replacing the existing Basel approach. FRTB (as you will see below) has a greater level of structure to the required calculations, a more prescribed approach on how to model your business, and a greater impact on how your entire trading business is run. FRTB requires that business be allocated to either the trading or banking book, and not jump the boundary in an arbitrary way. This means re-visiting any previous approach to modelling this structure, embedding it in an electronic representation, and ongoing monitoring. For business which requires an internal model, you must obtain, receive and maintain regulatory approval for the model. Any internal calculation model will need an approval from your regulator at a desk level. Approval maintenance will be based on three criteria – P&L attribution, back testing and a model independent assessment. Determining which desks rely on an internal model and which on the standard approach has timing constraints which prevent switching desks rapidly from one to the other. The underlying market data must be updated daily to avoid the above exceptions – any portfolio which fails under an internal model due to poor data will fall back to the standard approach and a potentially higher capital charge. 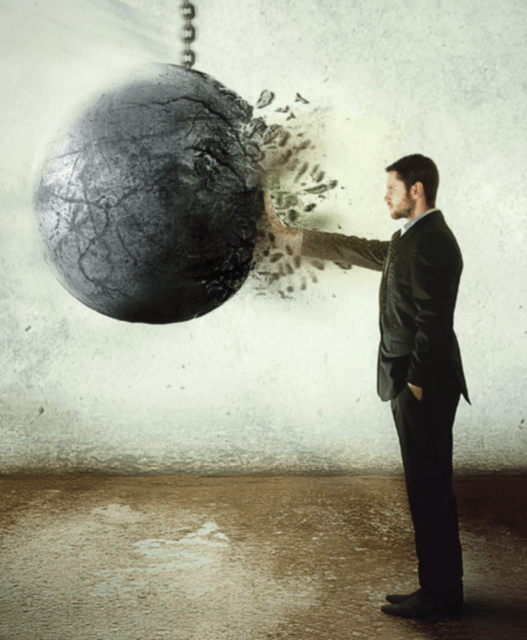 The Black Ball: Fundamental problems that banks will face. 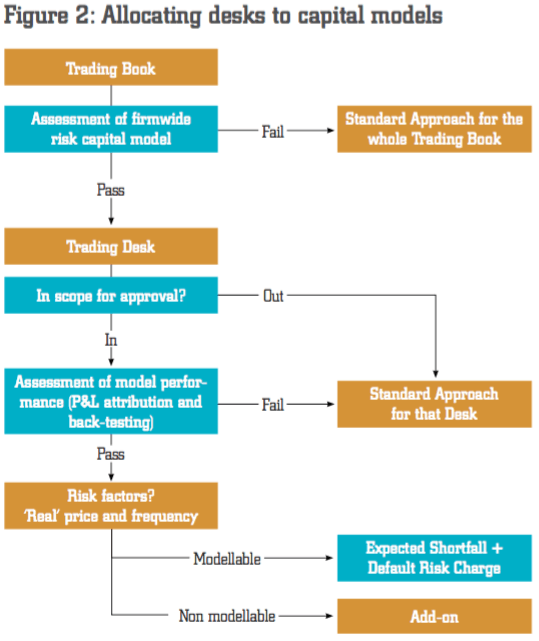 FRTB, which some banks have started to implement already, will be mandatory from January 2019, but as the name suggests will need a fundamental approach to deciding how best to structure each bank’s trading activities, how to maintain business as usual risk and regulatory governance processes and how to implement the required additional computational components and the ongoing maintenance of compliance under the new regime. Controls between the boundaries of the banking book and trading book. Including Expected Shortfall (ES) as the main exposure measure whilst maintaining VaR for back-testing, stress testing and default risk (under IMA). Any solution will have to be able to handle existing VaR related calculations as well as the prescribed Expected Shortfall method. Handling both will mean there will be significant increases in computational processing power, aggregation and reporting which current systems will not easily be able to accommodate. By augmenting existing systems through deployment of an FRTB specific module, the bank will be quickly able to undertake all necessary computational requirements without changing BAU processes. Strengthening the relationship between the standardised (SA) and internal models approach (IMA). Obtaining desk by desk approvals for Internal Models. Every bank will be doing same things, potentially; getting the approvals in the first place will require substantial effort, documentation and empirical evidence to support each application. By deploying an FRTB specific solution that runs alongside existing BAU Market Risk systems, the bank will be able to test models, support validation testing, provide auditable evidence and run the 250 day tests with real data sets. Once approved the models will need to be tested and maintained. This adds a huge amount of administration and desk level scrutiny. The FRTB solution should be able to provide the capacity to support each desk and specified users to test and maintain control over their models, PnL Attribution tests and back testing. Should a model fail then the bank will need to re-apply; this will need to either be avoided through stress testing or managed through regular reporting and model validations. Again an additional requirement not easily supported in existing BAU solutions. 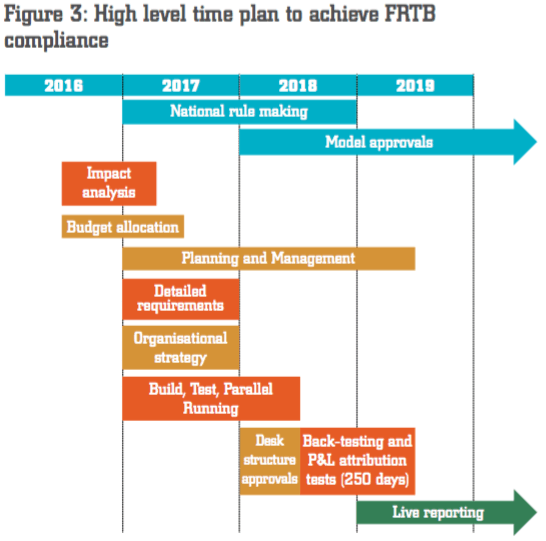 The deadline to comply with FRTB is January 1st 2019, leaving approximately two years to plan the development, testing, approval and deployment of your solution. The high level time plan looks like this. (See Table 1). A typical implementation timeline for a bank would look like this, with assumptions about national rule making and the timing of model approvals being specific to each firm. (See Figure 3). 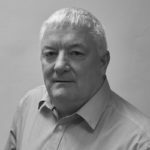 The latest date your firm can complete implementation is December 31st 2019 – but – every other firm will be making submissions for necessary approvals, and some public commentators have said that from mid-2018 onwards this has the potential to become a bottleneck for firms who don’t get going early. Mobilisation of an FTRB team with an accountable executive to lead your implementation across multiple departments/disciplines (front-office, risk, treasury, finance, operations, IT). Allocating budget for the programme, from now until compliance is reached. High level requirements for people, software and hardware. Whilst the calculations will require systems, the governance and allocation of roles and responsibilities is also expected to be non-trivial and will need to be carefully thought through. Prototyping using existing feeds and models, and gap analysis for future requirements. Making an early assessment of the impacts of FRTB and discovering the missing pieces for the full implementation. Organisational changes, policy development, systems implementation. Preparing for the 250 test period. Testing, calibration, benchmarking, initial results – a precursor to the 250 test period, which can’t start unless the systems and people are already signed off. Back-testing and P&L attribution testing for 250 days – required by the regulation to achieve approval. Model approvals, regulatory approvals, parallel running. Production, monitoring, and permanent regular reviews. 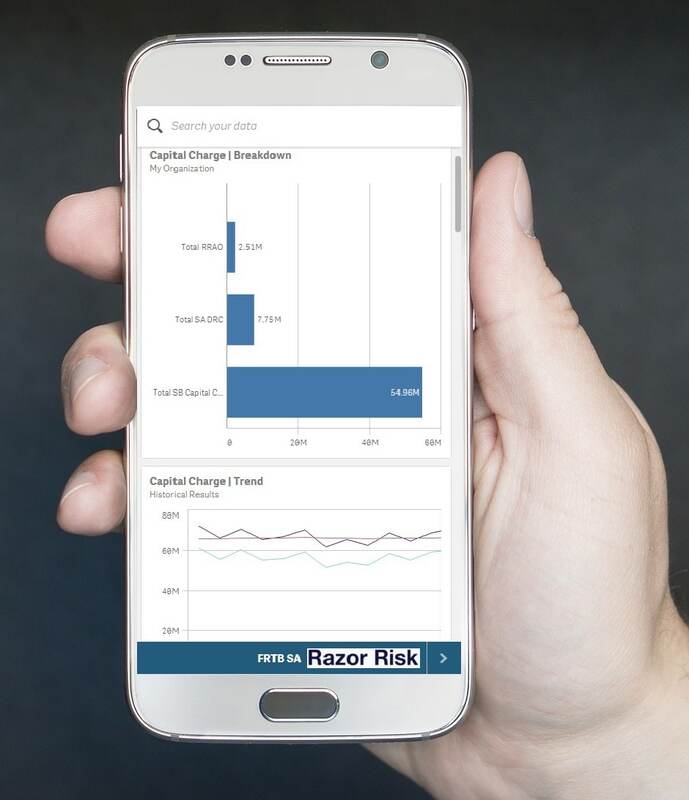 Razor Risk has made significant investments and advancements to create a platform highly focussed on enabling firms to comply with FRTB. 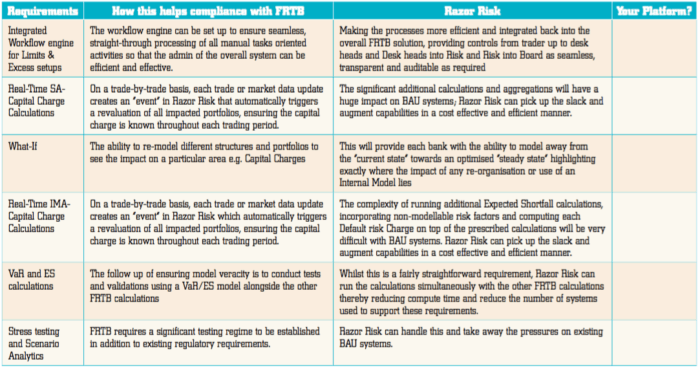 Here we summarise the key platform requirements to enable you to evaluate your current platform versus the software available from Razor Risk. If you haven’t already, create a regular communication process to track the state of FRTB and national rule-making. Use the platform checklist above to benchmark your current systems suitability to support FRTB. Appoint an accountable Executive, to prepare and communicate the strategy for your firm. Appoint a leadership group to receive, review and own your FRTB strategy. Be aware of the model approval bottleneck – don’t be at the back of the queue for regulatory input.